and diving lessons in the pool. and the nightlife of Cancún. 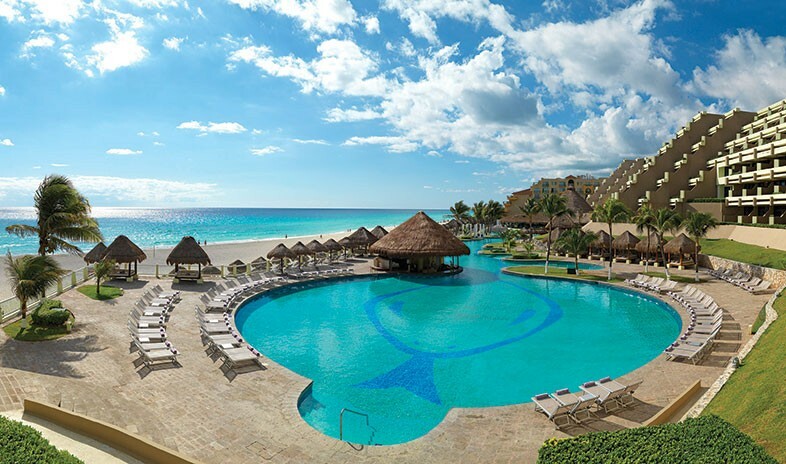 Deluxe Mayan-style pyramids lend a distinctive profile to the AAA four-diamond Paradisus Cancún. Set beside a stretch of sandy white beach in Cancún, the all-inclusive resort offers guests a medley of business-savvy meeting venues and incentive-worthy recreation options. Four swimming pools, 10 restaurants and 7 bars, a nine-hole golf course, and Yhi Spa all stand ready to reward a job well done. Meeting spaces begin with the Gran Salón del Prado, which hosts banquets for up to 1,100 guests, and the midsized Salón del Prado, with seating for 450. More than 20 other venues range from boardrooms to beachfront terraces—and the resort caters everything from breaks to grand buffets. On their own, group members may also sample a la carte dining options ranging from Latin fusion, Asian fusion, Mexican, and more. For elegant dining outside the all-inclusive plan, Tempo features signature cuisine by seven-star Michelin chef Martin Berasategui. Meanwhile, Coco’s Beach Club offers such amenities as Balinese day beds, organic cocktails, and lively music. The 649 guest rooms include 138 suites designated as Royal Service accommodations. Royal Service elevates the hospitality experience with such extras as private butlers, private terraces, an exclusive pool with bar, and a private lounge serving light refreshments throughout the day. A number of area attractions, including nature parks and Mayan archaeological sites, keep visitors happily occupied between meetings. In the evenings, group members can step out—in their dancing shoes, if they like—to sample Cancún’s legendary nightlife. As a former hotel executive and now currently the president/founder and owner of Xcape 1 Meetings and Incentive, I am very aware of the many facets of hotel services. On a scale of 1 to 10, I would give the Paradisus Cancun a 10++++++++++ in all areas. My first exposure to Paradisus Cancun was through Regional Sales. I would have to say that his understanding of the property, follow through, and his caring passion for his clients is outstanding. His partner in the sales department continued the exceptional service. Then I was introduced to convention services. The conference manager is with you the entire time your program is on property and group's director was always present to be sure groups were well taken care of. The resident manager was probably one of the most hands-on resident managers I have ever met. She was always walking the property to see how my group was enjoying their stay. She is amazing and is a 'take charge' kind of person. Family concierge is an added treat to the hotel options. The many restaurants bring such great dining options. I was recently on property for 6 nights and was not able to dine in all of its restaurants. The food is a 10++++++. I had three groups in the 4th quarter of 2014 and booked 10 groups at this property in 2015. Bringing just over 3000 guest to the property. As I departed the hotel after having three groups the first week in Jan of 2015, Resident Manager commented "We wait your return, this is your home." I truly feel that this is home and returning 5 more times this year. I can't wait to go back. The team at Paradisus Cancun is truly family. The event space is a great size for us and the AC in the meeting space worked very well (better than most other hotels in the area). Hotel team took great care of our VIPs. The beach area was perfect for our group. The new Coco's bar was awesome! And generally all the staff did a great job! One of the best things about the resort may be the Royal Service area. Everyone who stayed in that area raved about the resort. Royal Service team really knocked it out of the park tending to our VIPs. But I also have to salute Front Desk team because the check-in and check out process was probably the most efficient in the history of our program. Visiting multiple resorts and hotels to find the perfect location for Power Home Remodeling Group's annual Holiday party, I could not be more satisfied with the decision of working with Paradisus. From the impeccable performance of the management team throughout each of the planning and implementation procedures of our weekend-long trip for over 1300 guests, to the top-notch services provided by the hotel staff, it is hard to imagine working elsewhere. Returning this past December to host our Second Annual Party with Paradisus, the satisfaction throughout our Executive team and Power Community has flourished. Not only is Paradisus an exceptionally unique venue within the Cancun area due to its distinctive decor, remarkable entertainment and incomparable food and beverage, but also, the overall client experience is one you cannot compare. Home away from home – that is how I feel every time I stay in Gran Melia Resort in Cancun. For me the hotel’s greatest asset and pride is their friendly and caring staff that go out of their way to wow each guest. Even the simple gesture of the staff putting their hand in their left chest then nodding or bowing seem to say “at your service”. We’ve held several workshops in this hotel and they never fail to make us feel special. The staff’s attention to detail and willingness to help makes a big difference and great impact. Every time I need to book a workshop or group in Gran Melia Resort, I do not worry that the event will be successful and my guests will be happy because the Gran Melia Cancun team never fails to provide the best and warmest service and hospitality. The friendliness and professionalism of the entire Gran Melia staff is to be commended for delivering an above-and-beyond experience. The entire front line and back of house were nothing short of awesome. Our guests were wowed by the beautiful view throughout the stay.The staff was very accommodating.